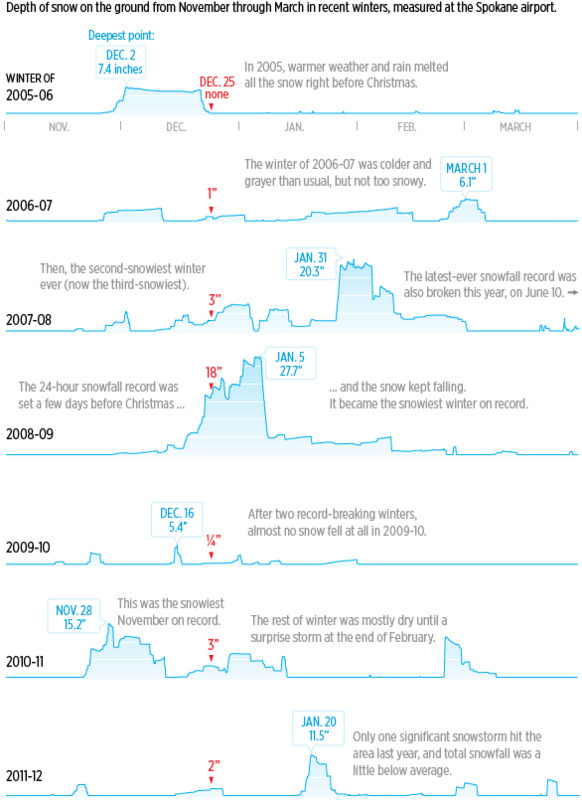 Last week's issue included these charts of how much snow has been on the ground in Spokane in recent winters. We've had white Christmases almost every year recently, though it's rarely the snowiest part of the season. This map from the National Climatic Data Center shows how our region falls just on side of more-likely-than-not when it comes to white Christmases. And, indeed, this year's Christmas was again snowy. It looked a little doubtful last weekend, but a storm came through just in time to snarl holiday travel plans. Here's what the chart looks like for the winter of 2012-13 so far, through the end of Christmas Day. The snow depths charted here come from National Weather Service measurements at the Spokane International Airport location. The actual amount of snow on the ground varies a lot even within Spokane, and of course places closer to the mountains usually have more. Here's a map of snow depth in our region on Christmas Day. You can search for data from other NWS observation locations here.